Maybe the rest of the world does its soul-searching in late December and makes its resolutions on January 1st, but I’ve always found that the relative quiet and desolation of mid-January is more suitable for personal reflection than the frenzied holiday season. Or it could be that I’m more philosophical this time of year because with a birthday in late January, I’m more keenly aware of the passage of time. Whatever the reason, I was recently struck by the thought that when I turn fifty-seven in a couple of weeks, my time spent competing as a masters (over 40) runner will exceed my time spent competing as an open runner. This seemed like an important thought, so I shared it with a few of my teammates while we warmed up for an indoor track workout Friday night, and then again as we set out for a long run Sunday. Although it seemed like a big deal to me, the response from my teammates was a collective shrug, or as much of a shrug as a pack of runners can pull off when trotting along at 8 miles per hour. Obviously, the topic was a lot more interesting to me than to anyone else! I think I know why the same thought struck me so forcefully, but completely failed to resonate with my running companions. It’s a little depressing to think about, but I’m almost always the oldest guy in the group now, and most of my training partners first met me when I was already in my forties, and eligible for age group prizes (“consolation prizes,” I used to call them). Other than Terry, who celebrated his fiftieth birthday yesterday, there isn’t a single person with whom I train regularly who ever saw me compete as an open runner. As far as they know, I’ve always been old. So when I realized that I had been a masters runner longer than I had been an open runner, the shock wasn’t that I had slowed down so much. Having to live with declining performance is simply the price one pays for continuing to compete, and I don’t worry about it or let it bother me. The shock was that what I had once considered the main body of work was being pushed so much farther into the background by my recent running, or lack thereof. On the other hand, maybe that’s a good thing. I’ve probably had more success — at least in relative terms — as a masters runner than I ever did as an open runner. Although in absolute terms, I was better in my 30’s, my age-graded times in my 40’s and 50’s have been consistently better than my open times. Also, as a masters runner, I’ve been more competitive with my cohort. But at some level, I still cling to a different image of myself. I still see myself as that young man in his twenties re-discovering the joys of distance running, hungry for training, fueled by a wonderful combination of confidence and ignorance and a burning curiosity to know how fast I could go. And farther back in time, I can still picture an even earlier me, the high school “track star” who found a niche in running the mile that allowed me to see myself as the successful athlete I’d always hoped to be. 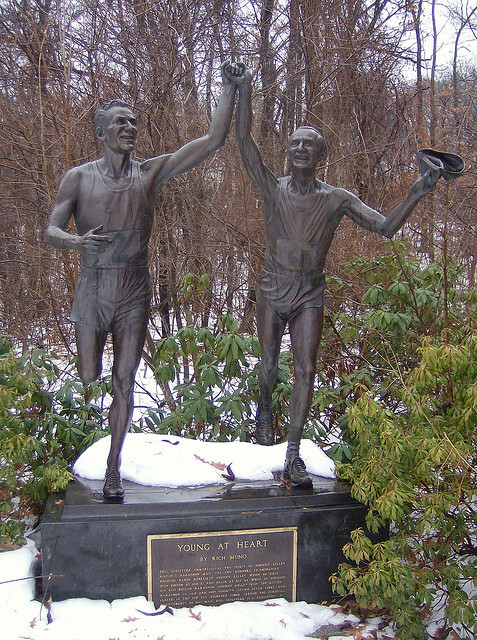 On yesterday’s long run, we passed the statue at the intersection of Walnut Street and Comm Ave in Newton that depicts the young Johnny Kelley, who won two Boston Marathons and finished 2nd seven time, clasping the hand of the old Johnny Kelley, who continued honoring the race well into his eighties. The statue is the work of sculptor Rich Muno, and is entitled “Young at Heart,” after a favorite song of Kelley’s. Of course, we all had to touch the statue. Kelley finally retired at 84, having run Boston 61 times. At my age, he still had another 27 Boston Marathons ahead of him. The young man in the sculpture holds the hand of the old man, encouraging him on. Or maybe it’s the other way around. This entry was posted in Weather and Seasons and tagged rich muno, young at heart. Bookmark the permalink. I understand – completely. Thank you letting me know that I am not the only “masters” runner who feels this way. Thanks for the comment — and the understanding!